Treadmill update: Still using that great playlist. I think it’s just about perfect now, good warm up and cool down songs, and I like how the ZZ Top stuff is always about the same tempo, no matter what song it is. It’s a long, stretched-out stride because it’s just a bit slower, intermixed with the faster pieces. Because of the ZZ Top songs, this has made me think 3.3 MPH might be my top speed. Of course, a taller person would probably have different requirements but this works for me. According to my friend Mary, elevation is the key, speed isn’t as important. (More about my friend, Mary later.) I’ve started doing that, and true to my exercise-nature, I’ve started out with 1% and will continue with that until it seems “easy”, if that ever happens. Blog stats update: I thought July wasn’t going to make it, that it would be the first month that wouldn’t show an increase in readership, but that wasn’t the case. It’s now August that I think may be a problem. See these stats. Where have all the readers gone? Maybe I’ll slip in an extra post, see if I can bump it up to at least equal July. Is that cheating? We (my husband and I) recently traveled to Florida by car. We discovered we could take I77 instead of I75 and it would add almost nothing to our trip. I saw that we would be going close to Charleston, SC where my friend, Mary, lives. Mary was one of my best friends in high school, and though we lost track of each other for many years, recently, we’ve been in touch again. She hosted a one-week get together at her lovely waterfront home in April of 2010, which we coined the GTE (Get Together Extravaganza). The preparation and logistics of getting seven women together for a week was intimidating. The morning after we’d all finally got there, Mary had gift bags for all of us, and included were matching tee shirts, coffee mugs, and funny sunglasses, among other things. Here is a picture of the seven of us. I hadn’t realized how appliance-happy Mary was, until our recent visit. The first night, I don’t think we used any appliances but early next morning, we were treated to coffee via the new Keurig coffeemaker. We were suitably impressed by this very high tech device. Then Mary whipped out the Electric Egg Poacher and five minutes later she slid a perfectly cooked egg onto toast. While I watched, she went to the closet to get the Electric Garlic Baker. Yes, there really is an appliance just for that. She had a dinner party that evening, so around 5-ish out came the Electric Martini Shaker. After a few dirty martinis and citrus something martinis were imbibed, we settled into dinner (which was delicious, but to my knowledge, no special appliances were used in its preparation). At the table we used the Battery-Operated Wine Decorker to liberate about three bottles of red wine. The next morning, we had waffles on the (you guessed it!) Electric Waffle Maker. And now I hear that Mary is now the owner of an Electric Crepe Maker, and the next time we go, it’s crepes, Baby! By the way, everything was delicious, thank you again, Mary! I’m ending this post with a general gripe, and if anyone can help me – PLEASE! I am losing my mind, losing “it”, losing control, losing my temper. No matter what application I’m in, Word, email, any application where I am typing along (and I’m pretty fast, back in the 60’s I could do 60 wpm – that’s words per minute with no errors). Anyway, I am happily typing along and all of a sudden my cursor is somewhere else in the document! The typed words are then in their new location, whkeyboard? ich of course makes absolutely no sense. It’s happened here, as I have typed this about 10 times. Is it my laptop, is it my keyboard? OMG, it just happened, see that, up there? Sorry this post is not about writing. I haven’t been doing much writing, but I did compose a poem to be used at the beginning of the book. I have also completed a short prologue, and I am still working on my Snowflake Methodology. Also I thought I’d like to do a post on music, what music I listen to while writing, and music that is included in my novels. This entry was posted in Blogging, Other Stuff and tagged baby boomer fiction, books about baby boomers, boomer-lit, friendship, treadmill playlist by Lynn Schneider. Bookmark the permalink. Pure speculation, but maybe a lot of people are returning from vacation in August, with all that entails: back-to-school, back-to-work, filling-gaps-in-the-closet shopping, or just shopping for the sheer pleasure of it (not in my case, of course, as I’d rather put bamboo shoots under my fingernails than shop). Or the next round of summer visitors arrives in August, and toward the end of the month it’s padded-room time! Sure love your blogs! Wish I’d been at Mary’s – can’t wait ’til next year’s GTE! You have a computer problem? And who do you suppose can assist you? ha HA! Yes, it’s your former cohort from Chase, who has many secret answers. You mention you use a laptop? Is there an infamous “StickPad” thingy nestled between the G, H, B, and N keys? Turn that sucker off. I also touch-type, and discovered the hard way the this fiendish little touchpad-like thingy can be verrry sensitive, and will randomly relocate the cursor while typing. The controls are usually in Control Panel >Mouse. Cheers! OK, another thought. If your touch-pad has “tapping” turned on, and you brush it just right while typing, you can relocate your cursor randomly. Controls should be in the same Mouse location. “Tapping” is evil, turn it off also. Ah, Joseph. It sounds so easy. Alas, it is not so. I don’t have the stickpad thingy and can’t figure out how to disable tapping, although I do see a lot of babbling about that problem when I google it. See, nothing has changed, I’m still a whiney computer neophyte, who is not quite geeky enough. Story of my life. Thanks for the information though, I do believe it is probably the tapping thing. So I am a little bit better off. I’m confused. This has happened to me as well, but ask your friend Joseph what he is talking about. I don’t see anything between my G H B and N keys. Was that a joke or some type of computer geek lingo that I shgould know but don’t. Where do I turn this thing off? I’m liking this blog. That was a good picture of all of us. Good thing for you! It isn’t on my keyboard either but I have seen it before. It is there, on some laptops. It is a very small button like thing in the space between those four keys. Not computer geek lingo. If I find what the answer is, I will let you know! Glad you like the blog, but took you long enough to read it. Haha! I would not post a picture of us that was less than flattering, I am not stupid. I know what you would say if I did. The cursor problem is also had by me and I am not on a lap top and I don’t have that thingy between the G, H, B. N or anywhere on my keyboard. Go figure. Mary is a sweetheart and yes, a true believer of electric goodies. I only have the waffle maker, a blender that was a 1st go round wedding shower gift in 69, a slusshy maker (just like a blender). My coffee pot is the ol’ run of the mill drip but I am playing with the thought of getting a Keurig (sp?) as soon as I win the lottery. My sister has 2, one at home and one in her office. I am jealous. It really is quick and so tasty and always hot. Just can’t bring myself to lay out the bucks just yet. Waiting for news of your latest book creation. Stay home, quit flitting around the US vacationing and get back to writing. We need another great novel for the upcomong winter doldrums that will be upon us sooner than later. Sorry you and Rodger can’t make it to Sue’s. We all had a “funtriffic” visit there last year. Like the blog, loved the picture! And thanks for the June GTE 2011 pic taken at Betsy’s I received last weekend. My gosh, we did let some years slip by but we are making up for lost time now. I am so enjoying every time we can be together!! 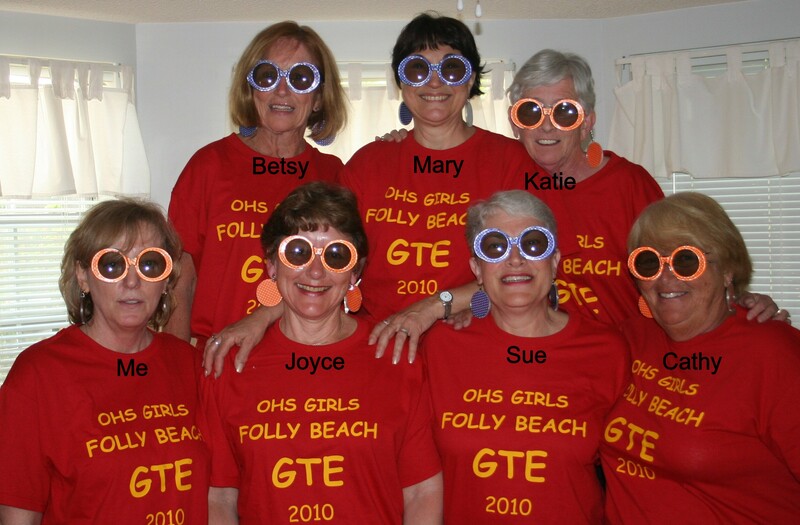 Like Sue-I too am really looking forward to the GTE 2012 at Mary’s. Joyce, I am not flitting about the country vacationing! Glad you approve of the picture, I think it’s pretty good of all. Nope, can’t make it to Sue’s, it’s enough we have to go to Rochester as often as we do. Will have to wait until April 2012.